Occarock is one of the top north coast crowd pullers! Although only a Trio, we are A Power Trio. Every Gig, punters are amazed about the huge sound that we produce, and the intense, ‘in your face Rock’ we deliver. The Band is now into it’s 10th year gigging around the traps -with the same line-up!! Not many acts can say the same. Dale (Vocals/Bass Guitar), and Dean (Lead Guitar), have been gigging together for the past 18 years, and were previously members of popular “The Milkmen” band. The Band is completed with Mick on Drums/vocals. 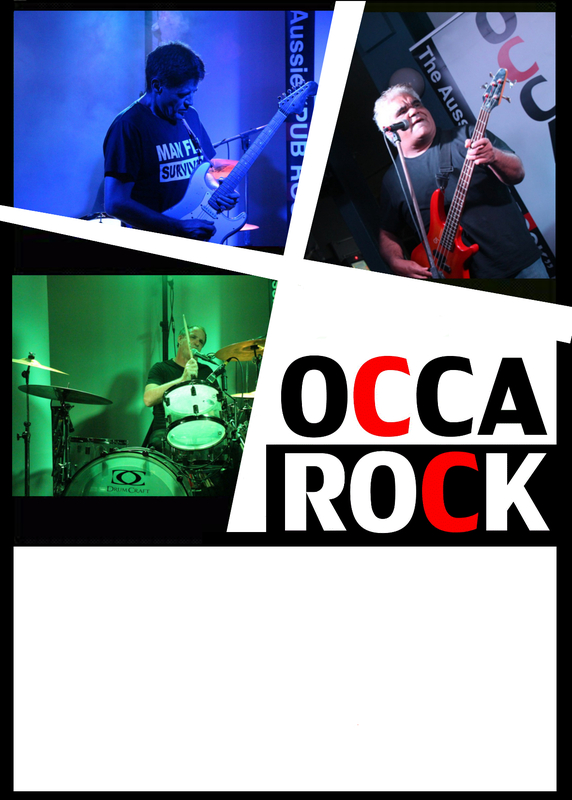 Occarock are a professional, tight, unit, with a great sounding PA, and an impressive stage and lighting presence. Our repertoire consists of classic’s from the 70’s through to today, and as one happy publican once was quoted: “every person in the room knew each one of the songs—what a great concept!” And it is a great concept, because Aussie rock has it own edge!. It represents all of us, and reflects the emotions of our nation at the time. And the best way to celebrate it, is to pay tribute to it. We also cover some International artists, to pay homage to some of our personal musical influences. Come and see us & say g’day.